I think the title of this one was “Man”? 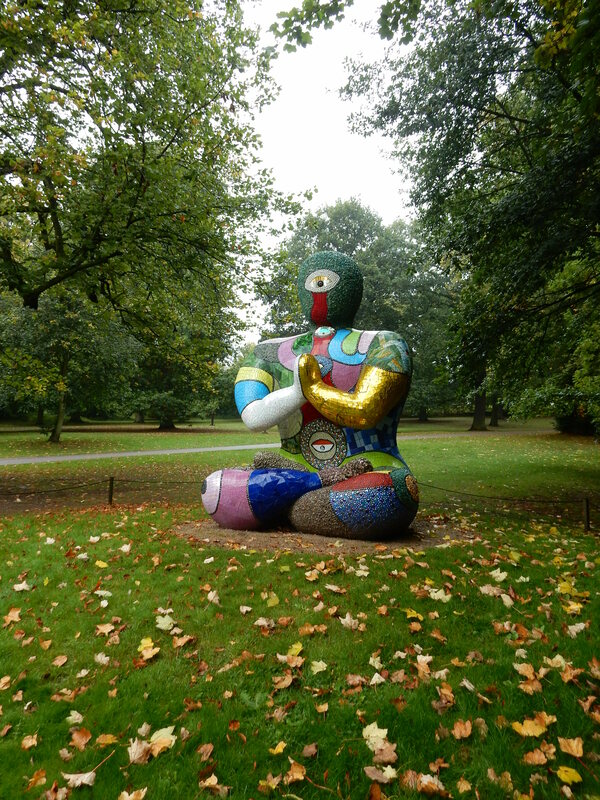 I guessed as soon as I saw this next sculpture that it was by Nike de Saint Phalle, even though it’s not her usual style – the colours fit, but her “people” are normally less recognisable for what they are. There’s a country house in the middle of the park, Bretton Hall. Apparently at one point it was used as a college and the latest plan is to turn it into a hotel. By the way, that metal slab on the right-hand photo is one of the sculptures. Told you some of them were odd! Finally, we reached the main attraction and let me tell you it was worth the wait!First we went into a little hut where there were copies of poems about WW1 on the wall and a notice board where people could put their tributes to people who had fought or died in the war, plus a giant window to catch your first glimpse of the bridge where the sculpture was dsiplayed, then it was on to the sculpture itself. I may have gone overboard taking photos – this isn’t even all of them! We walked all the way up to the Longside Gallery (through a field of cows, but no sculptures!) only to find that the current exhibition is very modern-arty and not that interesting. Random sculptures that even I could have made! Then we took the free shuttle bus back down to the main park and had a look at the last remaining sculptures. Proof that I was there with my camera! Overall, we were there for about 3 and a half hours, including a stop at the end for a cuppa and some cake. If it hadn’t been such a miserable day, we could probably have taken even more time walking around! Parking costs 8 pounds for the entire day but entrance to the park is free, so I think it’s worth it (especially if you have a car full!). There are also buses from Barnsely and Wakefield that stop directly outside the park if paying for parking bothers you. Even with the rain we had a good time and the poppies definitely met my expectations. The “Wave” sculpture is there until 10th January 2016 if you want to visit it, but otherwise the park is a great place for a day out in the fresh air at any time. 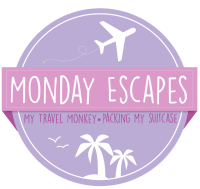 I’m linking this post up to Monday Escapes with Packing My Suitcase and My Travel Monkey. For more information and to join in click the button below.